​Algonquin Park stretches across 7,725 square kilometres of wild and beautiful lakes and forests – a canoeist’s and camper’s paradise. Hear the call of a loon; enjoy the sight of a majestic moose browsing. Kids’ summer programs offered. Also visit the Algonquin Logging Museum . HWY #60 runs through the south end of Algonquin Park. The East Gate is located just west of the town of Whitney. The West Gate is located just east of the town of Dwight. Millions of years in the making, lying under a hill of limestone thought by geologists to have been the bottom of a tropical sea before the age of the dinosaurs. Stalactites hang from the ceiling. The handiwork of nature is enhanced with colourful electric lights. See fossils of coral and sea creatures. There is a set of stairs leading you into the Caves and one that takes you out of the Caves. A beautiful trail that passes a sink hole will bring you back. Low-heeled shoes are recommended. For pictures underground, don’t forget your flash attachment. Picnic tables are provided. See website for details. ​Located just a scenic drive down the road from Ottawa, in the heart of the Ottawa Valley, is Calabogie Peaks Resort – Ontario’s premier mountain, lake and wilderness resort. Close to the city but far from distractions, unlimited opportunities await for families, friends, adventure seekers and those wanting to “get away from it all”. Resort summer activities include: hiking, biking, golf, tennis, boating, fishing, kayaking, canoeing & volleyball. Enjoy the beach and lake, pool and outdoor hot tub. Located: one hour west of Ottawa. Take Hwy #17 west; turn left onto Hwy #508 to Calabogie. ​A breathtaking adventure experience awaits you at Coulonges Falls Park, in the heart of Pontiac County. For the thrill seekers there is a children’s aerial obstacle course, zip lines and the VIA FERRATA; a rock climbing route 500m + long in the canyon over white water. For the land lovers, there is an incredible 48m waterfall, 762m ragged canyon, 1920’s log slide , 2 suspension bridges, lookouts, old growth pines, walking trails with artefacts of the log drive, and picnic areas. Frontier Trails Camp activities include: horse back riding, waterfront, music, archery, canoeing, kayaking, climbing wall, mountain biking, water trampoline and music lessons, overnight canoe and trail rides, whitewater rafting, sports & games etc, 100 acres of scenic trails, on the beautiful Bonnechere River. Logos Land is a family focused water play land and a full service vacation campground. Kids and adults enjoy giant (and kiddie) waterslides, water trampolines, paddle boats, a wading beach, mini golf, a petting farm and a trackless train! Our championship 18 hole golf course is one of the prettiest in the Ottawa Valley. Beach front cabins and RV’s available for nightly and weekly rental. Ask about birthday parties. This family-oriented destination, home to the R. Tait McKenzie Memorial Museum, is 154-acres of field and forest along the Indian River in Mississippi Mills. Explore this natural treasure year round along the seven km trail network. Play structure and picnic area complete this great way to spend the day. Museum opens daily, May 1 to Thanksgiving, 10:30 a.m. to 4:30 p.m. Constructed in 1867, this National Historic Site of Canada now features a blend of the old and new, all related to the history of the Mississippi Valley and the textile industry. Exhibitions range from early mill history and period mill equipment to cottage industry and eclectic modern fibre art exhibitions. Our museum combines traditional static and working displays of textile equipment and processes with activities and events focusing on the region’s heritage, culture and role of the textile industry in the development of Canada. TEACHERS SKI *FREE* IN DECEMBER. Just bring your School Board ID to the Front Desk. for Skiing-In-Schools programs. We specialize in ski and snowboard lessons for all ages and abilities, with a cafeteria and rental equipment readily available. For the non-skier we offer daytime tubing and snowshoe orienteering designed to meet Ontario’s physical education and social studies curriculum. With over 30 years of experience no other area offers school groups such a wide range of winter activities. An Affordable Family Getaway ... 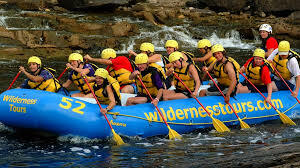 Experience the beauty of the River and the Excitement of Whitewater! The Ottawa River Raft Trip covers 6 km of thrilling whitewater rapids interspersed with quiet pools and sandy beaches - returning to the OWL Centre aboard our unique Pontoon Boat complete with a BBQ meal. This Full-Day Trip, is designed to appeal to parents, grandparents & children 50 lbs or more. Daycare is available for younger children, as well as overnight camping or cabin packages. ​The 2-hour Madawaska River Raft Trip winds its way through beautiful scenery and tumbling whitewater in the Algonquin Park area. You’ll bodysurf through rolling waves and take a spin in some of the River’s natural Jacuzzis. Location: 1-888-ONT-PARK (1-888-668-7275) for campsite reservations. Call Centre hours: 7:00 a.m. to 9:00 p.m. The Rural Ramble is a celebration of rural living at its best. Every year thousands of visitors flock to the region to bask in the glow of the brilliant fall colours and experience the Ottawa Valley first hand. The 2013 Rural Ramble will be a free online event, running from September 1st to October 31st, allowing Rural Ramblers’ to customize their fall touring experience! ​Did you know, most backyard insects live underwater as larvae? Have you ever wanted to learn to identify trees? Wondered why are wetlands special? Want to learn how maple syrup is made? From geocaching to the water cycle and everything in between, we are pleased to offer hands-on, curriculum based watershed education. For a complete listing of programs offered please visit us. ​This is an event that is fun for the whole family. Lots of wholesome local foods will be available for sampling and purchase and visitors will be able to source organic and natural produce, meats and baking mixes. There will be ready-to-eat baked treats and coffee for snacks, and garden fresh vegetables. This is a great opportunity to sample and purchase all sorts of foods produced here in the Ottawa Valley along with many different types of arts and crafts. Please see website for details of special upcoming events held throughout the Valley. ​Don’t miss the family experience of a lifetime! 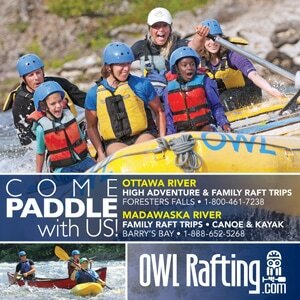 Enjoy all-inclusive family vacations at our full service Ottawa River Adventure Resort. Professional guides lead you down the beautiful Middle Channel of the Ottawa River on our Gentle Family Rafting trip. The 6 hour trip includes body-surfing (swimming some of the easy rapids), splash fights, exciting whitewater and a hearty BBQ lunch served beside a spectacular waterfall. Select our one-day trip as outlined above or enjoy our two-day Mini-Vacation Package or five-day Family Adventure Week…rafting, kayaking, catch and release fishing, sport yaks and more! High Adventure rafting for teens and adults available plus our very popular Teen Resident Kayak Camp! Camping or cozy cabins at our Adventure Resort along with; evening kids program, beach volleyball, hot tubs, pool, fireside lounges, beach, kayaks, pedal boats and mountain bike trails. Recently named “Canada’s Best” by Globe & Mail! Foresters Falls, Ontario. Follow signs from Highway 17, just over an hour west of Ottawa.